EMCOR Services Betlem performed an NYSERDA FlexTech energy study of the Rochester District Heating steam plant. Based on the results of the detailed analysis, several plant upgrades were implemented to automate the plant, increase plant capacity and redundancy, and improve operational efficiency and plant safety. A new flue gas heat recovery system was installed to reduce natural gas consumption and maximize plant efficiency. 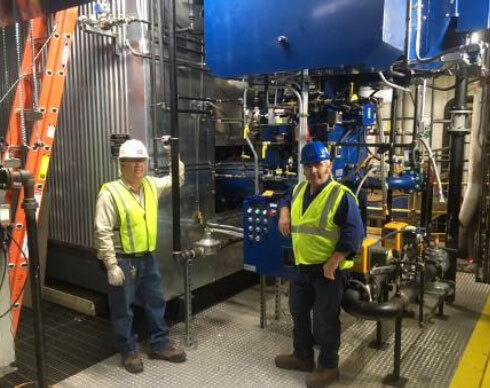 The installation of two new steam boilers will increase steam production to meet the anticipated 20% planned growth of the cooperative steam supply to accommodate added buildings. With these installations, the boiler plant capacity improved from 260,000 #/hr to about 300,000 #/hr with the peak demand expected to increase by 40,000 #/hr. By selecting duel fuel boilers, maximum efficiency, redundancy, reliability, payback, and occupant comfort is achieved for the client’s 46 member buildings. To better serve its member buildings, Rochester District Heating’s primary objectives were to improve plant efficiency and redundancy, improve the long term viability, and to increase steam production capacity of the plant. This design-build project included the installation of a new flue gas heat recovery system, the installation of two new English 50,000 PPH high-pressure superheated steam boilers with new economizers, the installation of a new 260kw back pressure turbine, replacement of the blow down heat exchanger, and a plant controls and automation upgrade. The new boilers have reduced emissions, improved efficiencies, and provided additional capacity and improved redundancy to the plant. A new plant automation system with HMI upgrades was installed and upgrades to the water treatment system, insulation, and lighting were also recommended and implemented for added efficiency. Rochester District Heating is a member-owned, non-profit cooperative providing district thermal energy heating services to 46 member buildings, covering 8.5 million square feet in the city of Rochester. The team of professionals who created this organization were driven to provide its members with an affordable and environmentally friendly heating service from a generation facility.